The house was named after a small factory from the 18th century. The cultivated by the farmers Krapp plant was used to obtain a red dye for coloring various materials. The technique we sat has been for centuries, but it was by the Turks particular importance. They produced in a complex process that "Turkey red", which passed by immigrants over to Europe and France from the 17th century experienced a revival. With the synthetic production in 1871, the production and make production came to a standstill. Originally had the Margravine Maria Augusta the building erected in 1710 as stables with adjoining carriage house. 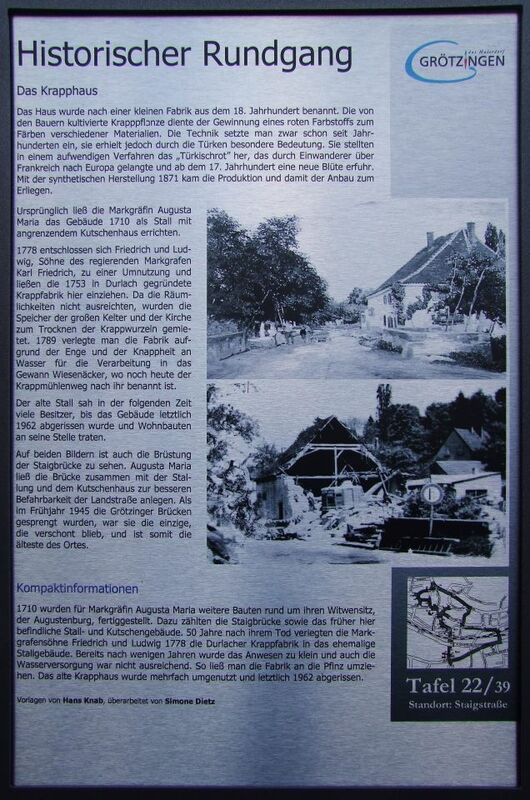 1778 decided Friedrich and Ludwig, sons of the reigning Margrave Karl Friedrich, a conversion and could collect the Krapp Factory, founded in 1753 Durlach here. Since the space is not sufficient, the memory of the great wine-press and the church were rented out to dry the Krapp roots. 1789 moved to the factory due to the tightness and the scarcity of water for processing in the Won Wiesenäcker where the Krapp Miihlenweg is named after her today. The old barn looked many owners in the following period, until the building was finally demolished in 1962 and entered residential buildings in its place. In both images, the parapet of the Staigbrücke be seen. Augusta Maria had laid the bridge together with the stables and coach house to improve the navigability of the road. In the spring of 1945, the Grötzinger bridges were blown up, she was the only one who was spared, and is the oldest of the place.